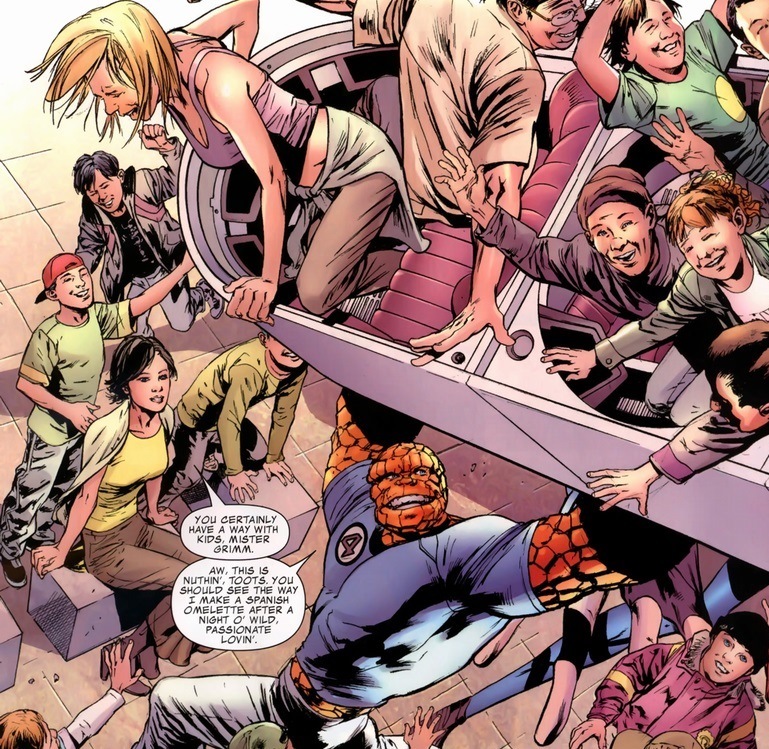 When the Fantastic Four had their rocketship bathed in cosmic rays, the Thing lost everything. 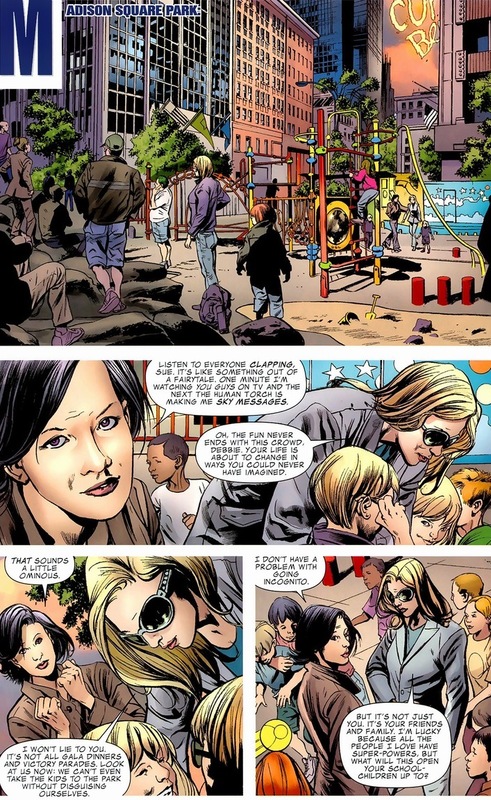 The others, for the most part, stayed themselves only with super cool new powers. 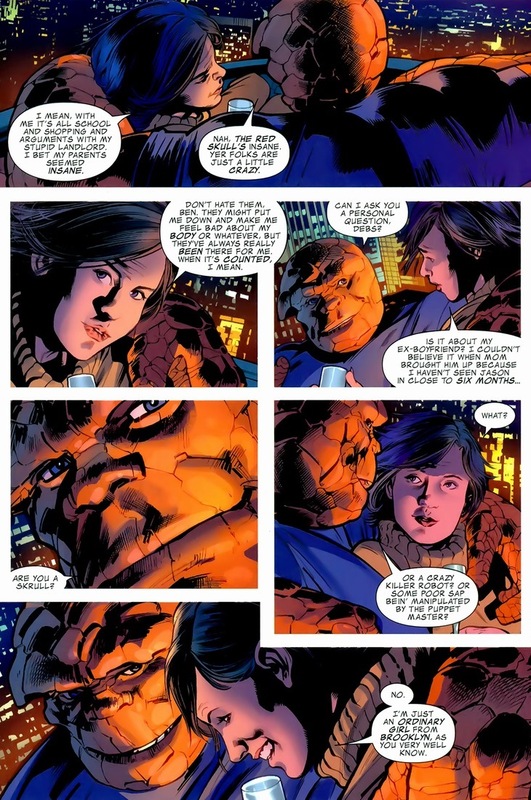 But poor Ben Grimm, now a six foot, five hundred pound rock monster, had a lifetime of self-loathing ahead of him. But don’t feel too bad. With his appearance and strength, he did become filthy rich, a major celebrity, an Avenger, and has saved the world dozens of times. A worthy trade, I’m sure. And today, he finds love. 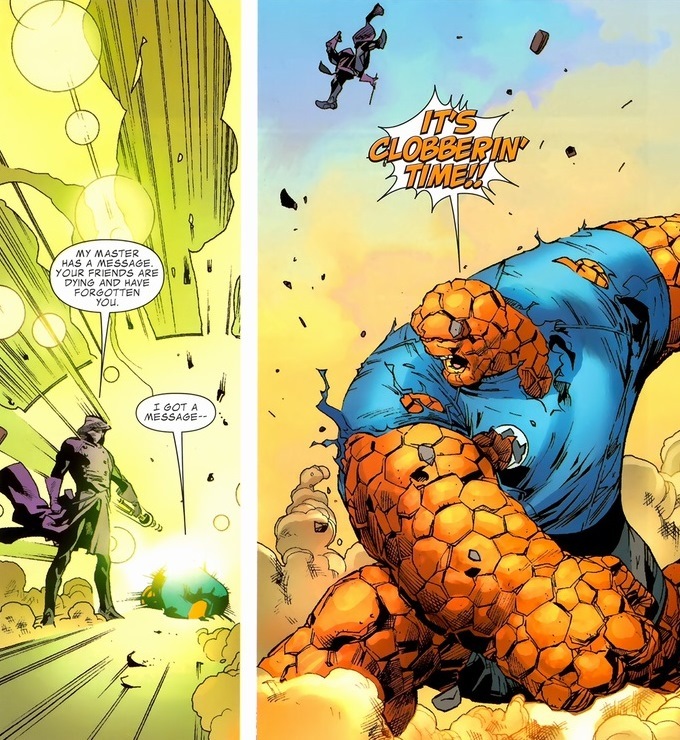 By the way, the final arc of Millar’s run contains one of the best Fantastic Four vs. Dr. Doom battles ever written. You should treat yourself. Anyway, our story begins innocently enough. 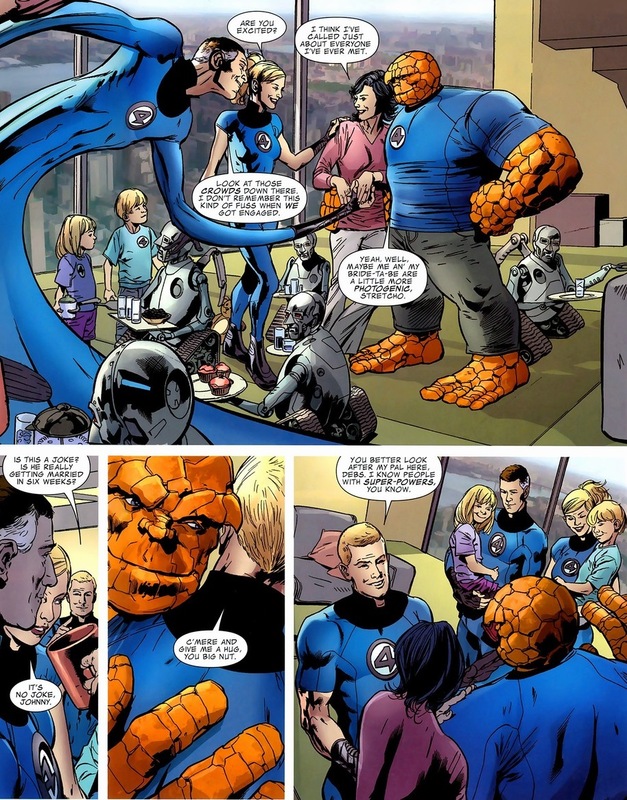 When not saving the world, the Fantastic Four like to do some philanthropic work, and what student wouldn’t enjoy an appearance by respectable, lovable superheroes? 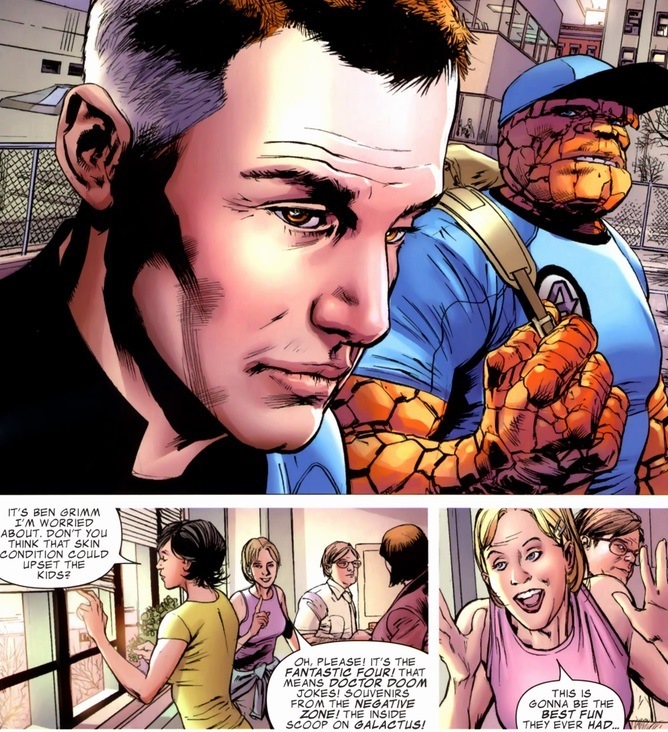 Mr. Fantastic’s marriage is fine. Sort of. 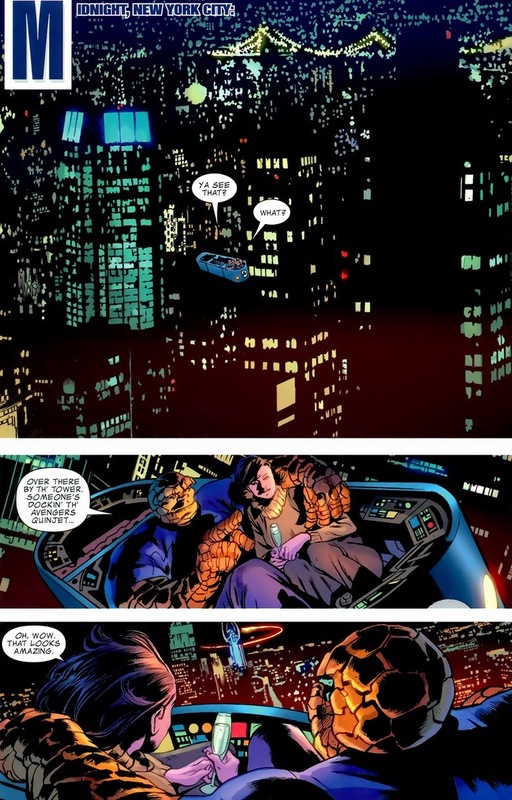 Now, the Fantastic Four have a unique position in the superhero world. Think of the team as a business. They possess no secret identities and the Baxter Building (where they live) is well-known and prominent in the New York skyline. 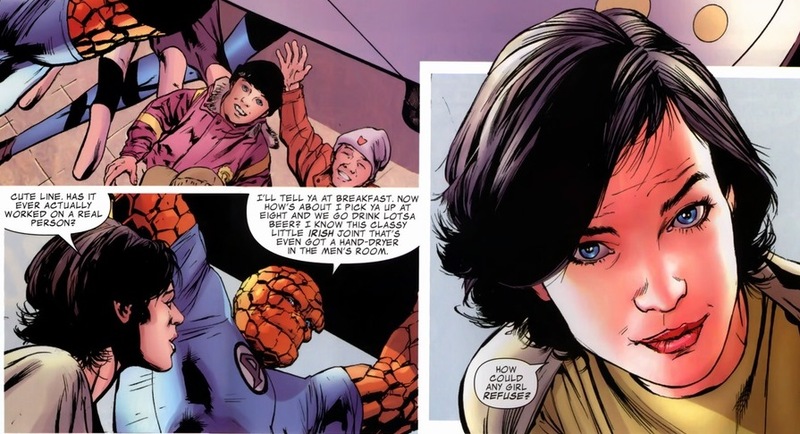 Reed supports the family through government contracts and patents while occasionally taking a break to defeat Galactus or whatever. None of them are public menaces. 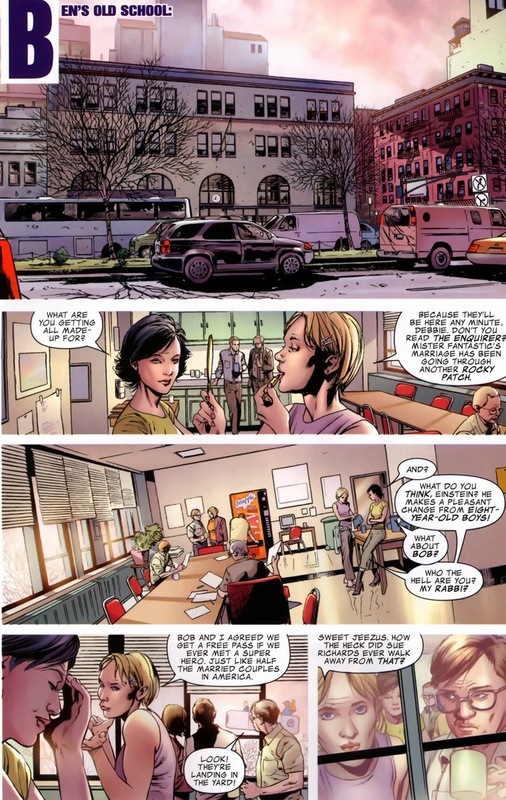 I’m just saying Spider-Man waltz into a school. 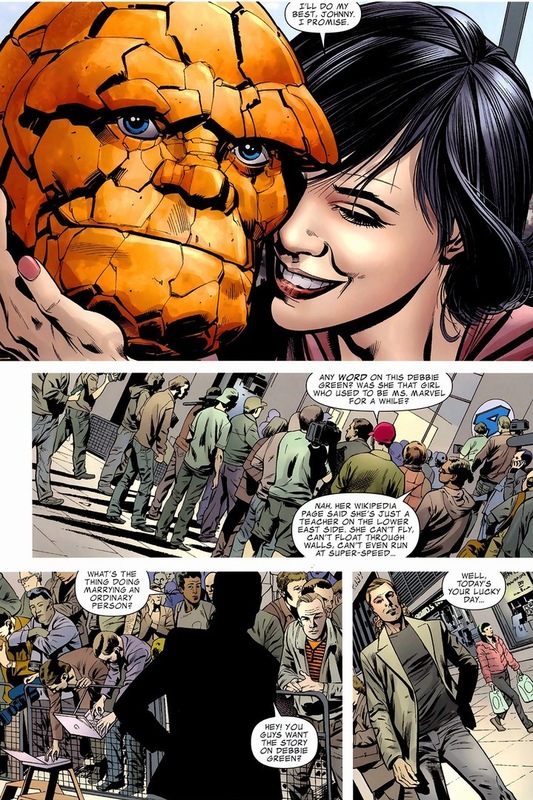 Oh, and want to see how the Thing flirts? Of course you do. From there, the romance blossoms. 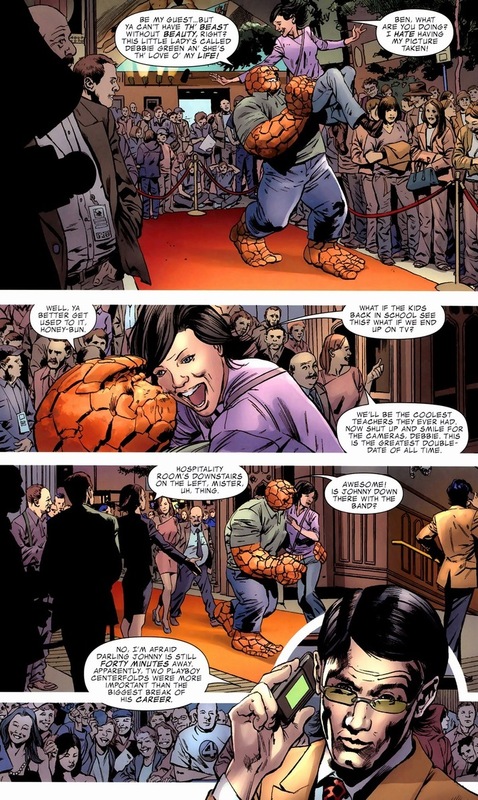 How could Deb not like the Thing? He can spout a decade of exciting stories, he has a delightfully confident personality, and he’s completely hairless. Plus, free rides in the Fantasticar. 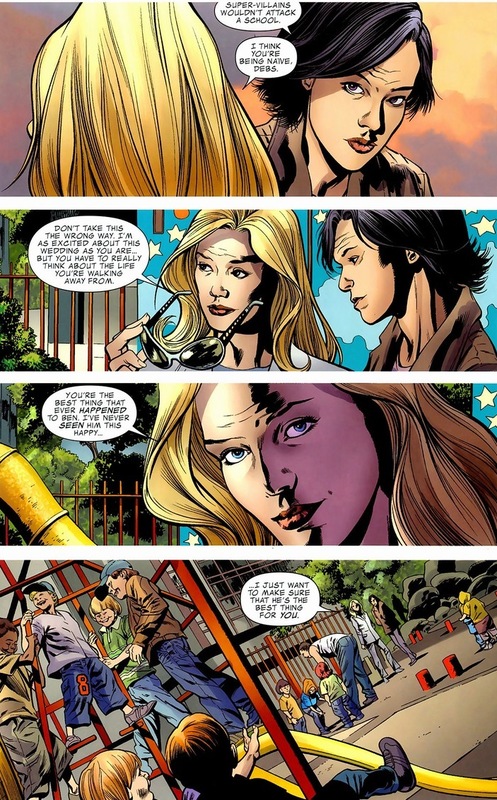 After a whole bunch of Human Torch subplots, the two lovebirds part ways for the night. And what kind of love story would this be without an uncomfortable part of the past brought up? I’m not talking about the Wizard or Mole Man, I mean from Deb’s past. Though more on that Monday. Pesky ex-boyfriends always cause so much trouble, even from totally normal civilians like Deb. But if a spurned lover is all there is to dig up, thank goodness. 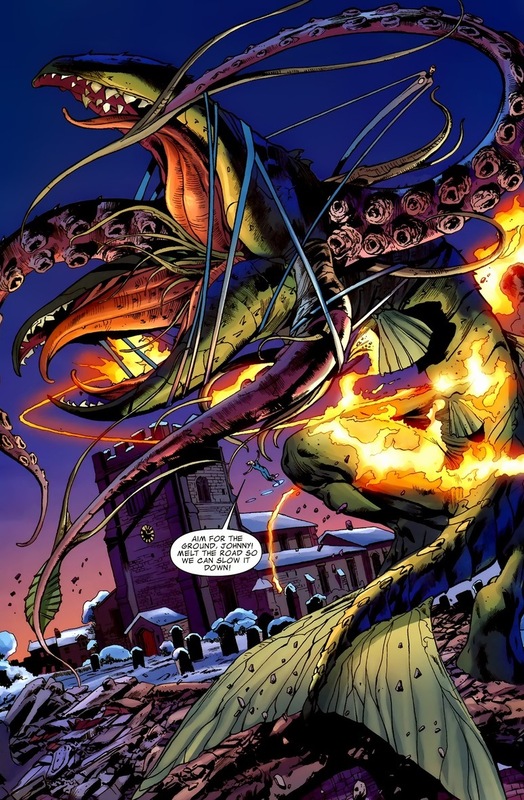 If she had superpowers, her ex would almost certainly be half-alien and half-octopus or something. 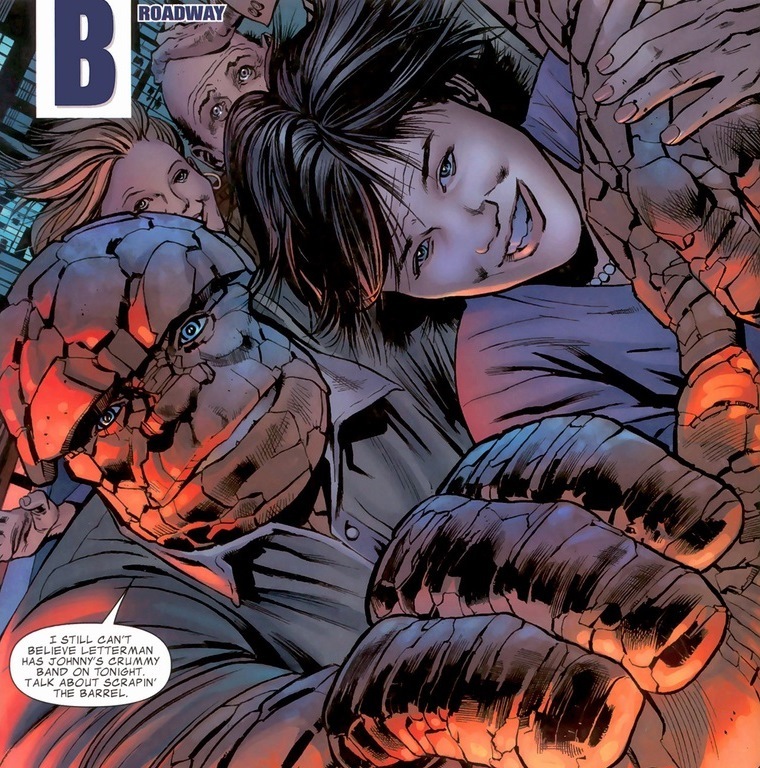 As the two become closer and the arc progresses, the Thing poses an important question. A super important question. Though since you’ve read the title of the article, I figure you can make a pretty good guess. Spoiler alert: she says yes. The drama picks up later in the arc, and I promise it’s juicy. 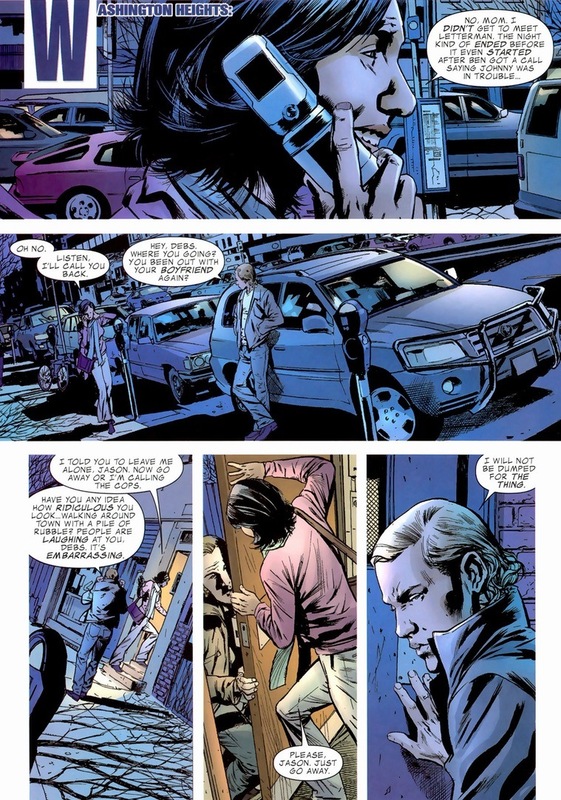 But this engagement does bring up an important issue: superheroes tend to live dangerous, brutal, and short lives. And the supporting cast? Far scarier than actually throwing the punches. 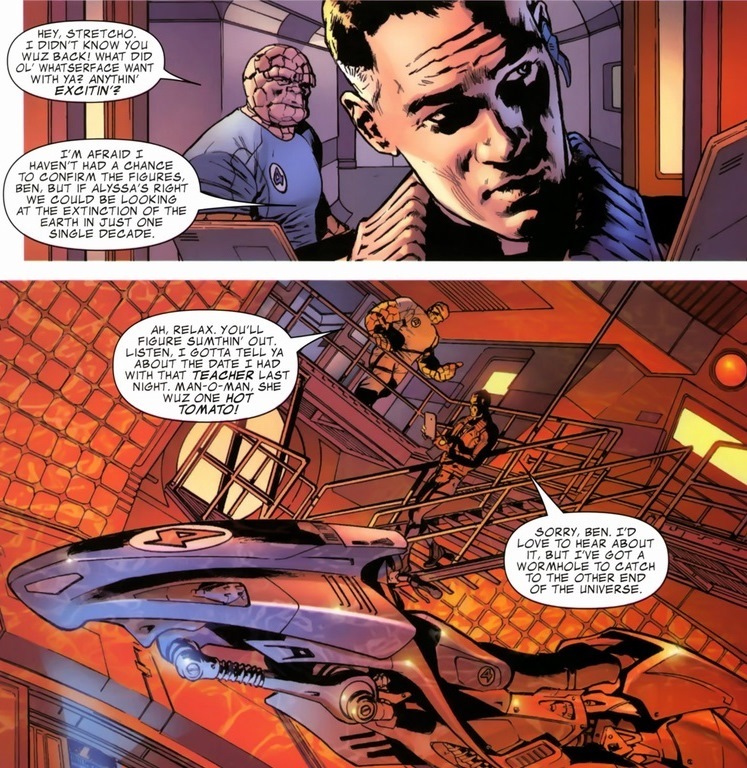 Turns out supervillains lack that morality to not target the loved ones, friends, and families of their enemies. Even with the Baxter Building containing the most advanced security measures in the known world, the threat doesn’t go away. Is he? Well, you’ll find out Monday. Or go look up the issues yourself, I can’t control what you do.